Motorcycle Industry Association presents:"The case for motorcycling"
June 15,2016 - BBC looks at Ride to Work Week! Ride to Work Week discovers cars and transit are dandy, but two-wheels are quicker! Nov 13, 2015 - Motorcycle Industry Association presents:"The case for motorcycling" ! In Europe, motorcycle commuting improves safety! May 29,2015 - LA Times: Lane-splitting for motorcycles is safe, says landmark Berkeley study! Jan 20,2015 - The Record: 10 good reasons to ride a scooter! Commuters discover a whole bag full of reasons to ride a scooter! Motorcycle and scooter use is climbing - we should embrace the trend and think about its potential to boost productivity in cities by reducing traffic congestion! You won't believe why! Because scooter drivers should ride the bus, not ride scooters! June 6, 2014 - The Digital Universe: Scooters Help College Students Save Big-time! WE APOLOGIZE! Although local papers like The Sun and The Province print scooter news, they quickly shove them behind pay-walls, so we don't have access after a week or two. July 13 2012 - The Science of 2-Wheelers: How Motorcycles reduce the emissions of the cars around them in traffic! Recent engineering analysis shows the positive effect that motorcycles have on the urban environment! City business journal is astonished at Regressive vote by Vision Vancouver councillors! 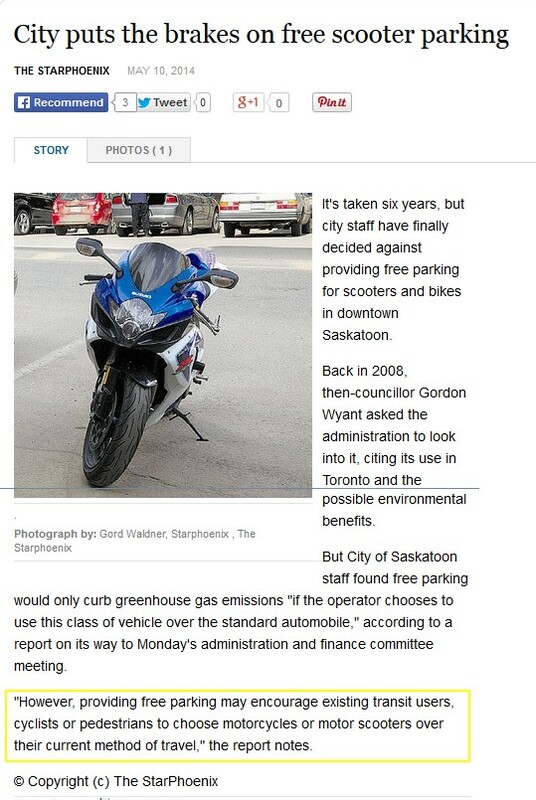 Province editorial takes Vision Vancouver councillors to task over motorcycle parking! Vision Vancouver City Council decides to make motorcycles pay big-time for parking!